ST. LOUIS, MO—Every urban area has “gap-tooth” lots that once featured homes, but are now vacant, or littered with crumbling, unsalvageable structures. EcoUrban, an urban redevelopment firm in St. Louis, is filling those lots (8,000 exist in St. Louis) with new smaller, more energy-efficient and affordable prefab and modular homes. This new kind of “360 degree” redevelopment—serving the city, neighborhood, low-to-middle-income homeowners, and developers—requires a new kind of house: A modular building manufactured off-site with green, sustainable features, then trucked to St. Louis, placed on a precast foundation, and finished on-site. In other words, certainly not traditional affordable housing, but rather a new kind of sustainable housing that is affordable for those who want to live in the city and may, or may not, have a car. The company’s latest redevelopment, Sullivan Place, is a partnership with a number of community and state housing, renewal, development and economic development organizations. The plan is for eight new homes to infill lots in the heart of metro St. Louis—a mile north of city center. The first house (2332 Dodier Street) recently went on foundation and is small at only 1,360 square feet, but features three-bedrooms, two full baths and all kinds of building products that improve its performance—lower the operating cost and make the indoor environment healthier. The house was built in Peoria, IL by Homeway Homes, an award-winning modular home manufacturer, and features: bamboo floors, cabinets made by a local green cabinetmaker, Low-E Energy Star-rated windows, low-flow water fixtures, dual flush toilets, low-to-no VOC paints, highly-efficient HVAC, humidity-controlling bath ventilation fans, and ventilated range hoods. All designed to conserve energy, water and maintain excellent indoor air quality. But, according to the builder, perhaps the most important green feature is one few will ever see: the house’s high-performance InsulStar® SPF Insulation made by the U.S. company, NCFI. 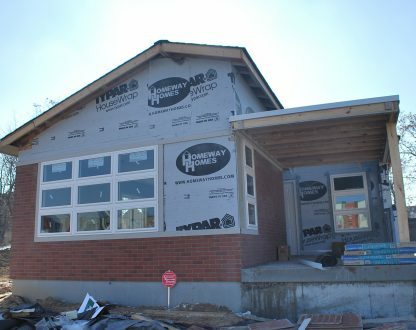 According to Jay Swoboda, co-founder of EcoUrban, “We are a green builder and were pleased to see that Homeway has made a commitment to superior insulation in all their homes. This made a big impact on our moderate-income buyer who will benefit from the great energy savings and reduced air leakage supported by the SPF insulation.” He continues, “Our testing showed an air leakage rate of less than 10% with a blower door test in December. We submitted the home to Energy Star for final review and expect a very high Energy Star rating and HERS score of around 50.” Ratings provide a relative energy use index called the HERS Index based on the Dept. of Energy’s EnergySmart Home Scale. A HERS index of 100 represents the energy use of the “American Standard Building” and an index of 0 (zero) indicates the building uses no net purchased energy (a zero energy building). The lower the value, the better. A home with a HERS Index of 50 is 50 percent more efficient than a standard new home. This development project is a partnership with two solid community development partners: Community Renewal & Development and the Regional Housing & Community Development Alliance with funding support from the Missouri Department of Economic Development, the Community Development Administration and the Affordable Housing Trust Fund of the City of St. Louis.